In 1997, Mr. Caprio attended a “How to Start Your Own Business” workshop at the local SCORE (Service Corps of Retired Executives) office. He was working for a company in the medical equipment industry, but figured that opening his own business might be a good “Plan B.” After he completed the SCORE workshop, he began to draw up a business plan and think about the logistics of starting his own company. In 2000, Mr. Caprio’s employer filed Chapter 11 bankruptcy. As part of the restructuring of the company, his department was closed. He quickly garnered several attractive offers from other companies, but wondered if his layoff was actually a blessing; it might provide the perfect opportunity for him to pursue his own business. The decision was difficult. Every prospective small business owner faces this dilemma in the beginning – take a stable job with a guaranteed salary, or take the risk of starting a company that might provide opportunities and personal growth that can never come from working for someone else. It’s not a decision that can be made lightly. When faced with life-altering decisions, Andrew Caprio relies on the strength of his religious beliefs to help guide him. He prayed and reflected on the matter until he was able to come to a decision that felt right. Equipped with his education and experience in the medical equipment industry and 10 months of severance pay, he set up Monet Medical in his basement on September 7, 2000. Monet Medical, Inc. purchases surplus moveable medical equipment (everything from portable defibrillators to hospital beds) from facilities all over the country. The equipment is then reconditioned both biomedically and cosmetically. 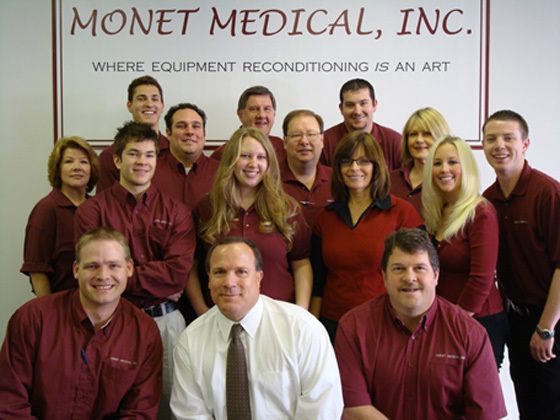 The company slogan is “Monet Medical… Where Reconditioning is an Art” (The company gets its name from the impressionist painter Claude Monet). Mr. Caprio believes that each piece of equipment that comes through his business should be reconditioned with great care before it goes on to its next home. Equipment goes through a stringent reconditioning process that includes biomedical testing and calibration, paint, detailing, quality assurance and three separate inspections. During the first year, the company reconditioned 771 pieces of medical equipment. After 14 months of operating out of Mr. Caprio’s basement, Monet Medical leased its first small space in a strip mall. Business steadily increased and after nine years in business, the company was able to buy the building that is Monet Medical’s home today. In 2010, the company reconditioned 4,868 pieces of medical equipment that will be used in hospitals, clinics, physician’s offices and other medical facilities across the country. Recently, Monet Medical added several new manufacturers to its product line, opened two new offices and entered some new markets: home healthcare, medical colleges and universities, and medical equipment planning/consulting. In addition, the growing company plans to welcome six new employees in the next few months. Never lose a sale because you can’t afford it. This careful attention to finances has helped Monet Medical survive and even thrive during a recession. From humble beginnings as a small company operating in a basement, to winning the 2011 Utah Small Business Person of the Year award, Andrew Caprio has proven opening his own business was the right decision.